Cleaning up the community, one car at a time. ECO FRIENDLY - we recycle and reclaim our water ! 24 hour RAZOR WASH at BOTH LOCATIONS! We offer two convenient wash options, the velvet touch express tunnel and a 24hr touchless Razor wash at both locations. All designed to get your car clean, dry, and shiny in record time. Our service associates deliver customer service with a smile. They will help you decide on the best wash for you! 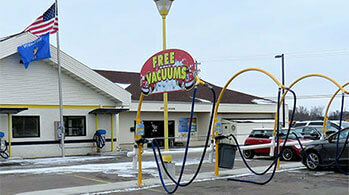 At each of our car washes we offer free self-serve vacuums to our customers. Make it a quick inside clean or a detailed clean – up to you. Buy a $25.00 gift card receive an extra $5.00 20% SAVINGS! Join our Monthly Unlimited Car Wash Club and SAVE! Our top three washes are now offered for the monthly car wash club. 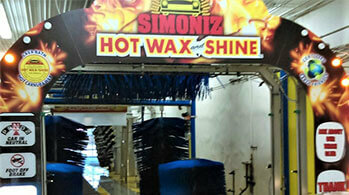 Each program pays for itself in fewer than 3 car washes per month! Wash your car just three times and SAVE big! Sign up on your next visit. 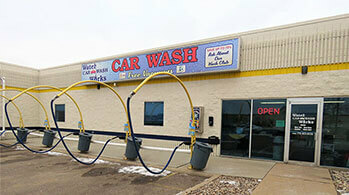 We offer four express exterior washes designed to get you in and out in less than three minutes!